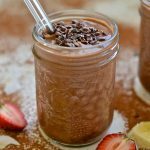 Get your chocolate fix in smoothie form! Velvety smooth, rich & chocolatey but full of good for you ingredients, this healthy chocolate smoothie will get your day started the right way. Add all ingredients except maple syrup or 1 date to a blender. Blend until velvety and smooth. This takes 1 minute on the smoothie setting with my Blendtec . If your blender isn't a high powered one it will probably take a little longer. Taste a little bit to check sweetness and add either some maple syrup or a medjool date if necessary. Blend again to incorporate. Maple syrup or a medjool date are optional ingredients. If your banana is very ripe it will probably add enough sweetness on its own. I served my healthy chocolate smoothie with a sprinkling of cacao nibs for extra texture and nutrition.